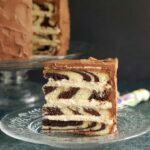 Marble Cake doesn’t have to have two totally different textures between the vanilla and chocolate swirls. 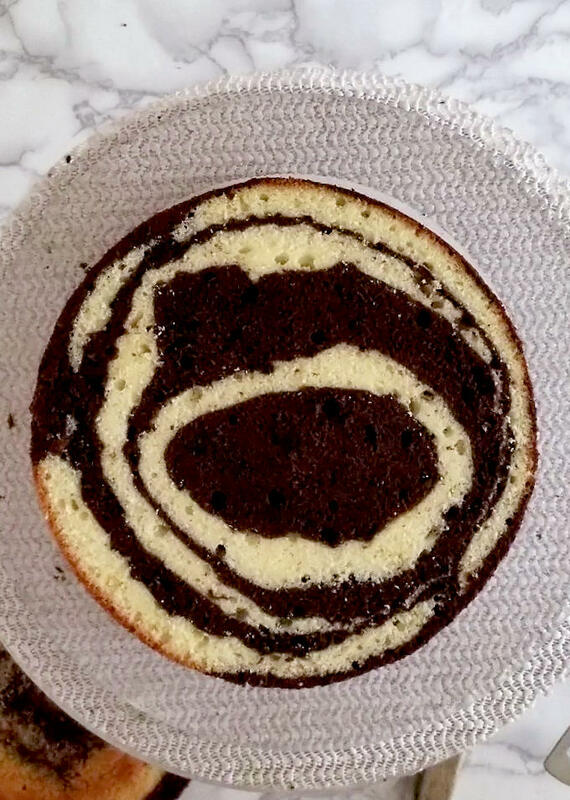 I created a process for making marble cake so that both flavors have the same exact soft and tender crumb. This cake is so tasty and so pretty. If you’ve ever made marble cake I think you probably know what the problem is. 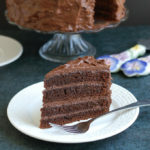 Virtually all the recipes I’ve seen mix vanilla cake batter and then flavor a portion of that batter with cocoa, or cocoa and butter, or melted chocolate to create a chocolate cake batter. When you take a fully mixed batter and add cocoa or chocolate to that batter, you will inevitably change the texture of the cake. 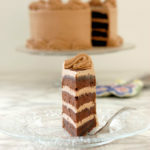 You’ll have a denser chocolate cake mixed with a lighter vanilla cake. So, how do we get cocoa into the batter without making the chocolate cake heavier? Well, I’ll tell you a little baking secret; cocoa acts like flour in cake batter. 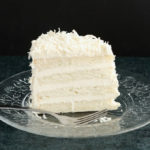 You can turn almost any vanilla cake recipe into a chocolate cake by replacing a portion of the flour with cocoa powder. In fact, my initial answer to the question of how to make a marble cake with a consistent texture was to make two batters. First, make a vanilla batter. Then make the same recipe again, replacing a portion of the flour with cocoa. Of course, the trouble with that solution is that you have to mix two batters. So my goal was to create a good marble recipe mixing one batter, but keeping the ingredients in balance. Now I had to figure out how to replace some of the flour in half of the cake with cocoa, while only mixing one batch of batter. My solution was to set aside some of the flour before mixing. I reduced the amount of flour in the original recipe by 1 cup. I mixed the batter and divided it into two equal portions. Since I reduced the amount of flour in the recipe by 1 cup, that means each half of the batter needed a 1/2 cup added back in. I stirred a 1/2 cup of flour into the vanilla portion of the batter, and a 1/2 cup of cocoa into the chocolate batter. Now I had two batters with the same proportion of ingredients. I baked the cake and was happy with how the process worked. I had a cake with consistent texture throughout. The trouble was, I wasn’t completely happy with the taste of the cake. Because of the intense chocolate flavor, the cake needed to be a bit sweeter. It wasn’t quite “blog worthy” yet. 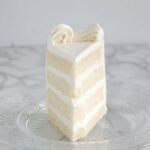 I increased the amount of sugar in the batter and, while I was at it, I added a little more buttermilk and butter so the cake would be very tender and tasty. The results are wonderful, if I do say so myself. 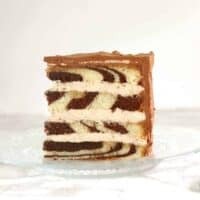 You can see in the video how I put the batter into the pans to create a wavy marbling that looks striking when the cake is cut. 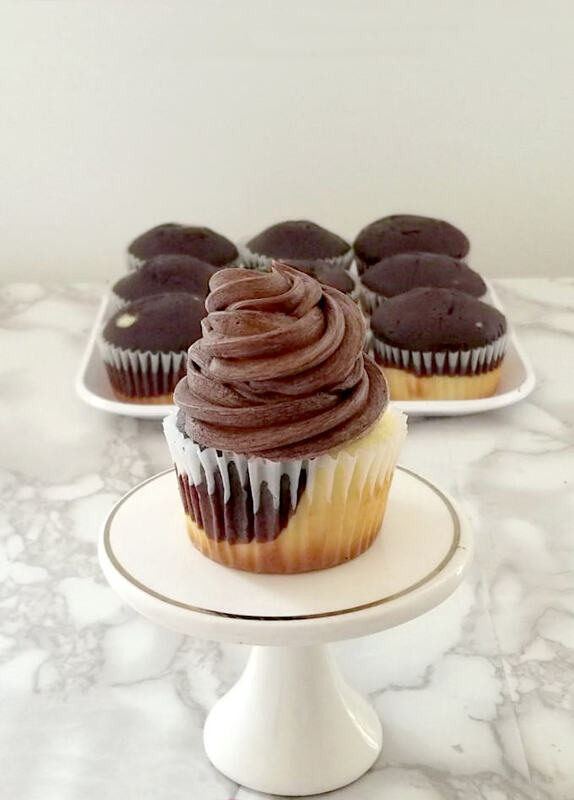 To make marble cupcakes simply drop a dollop of vanilla batter into each cup and then a dollop of chocolate. 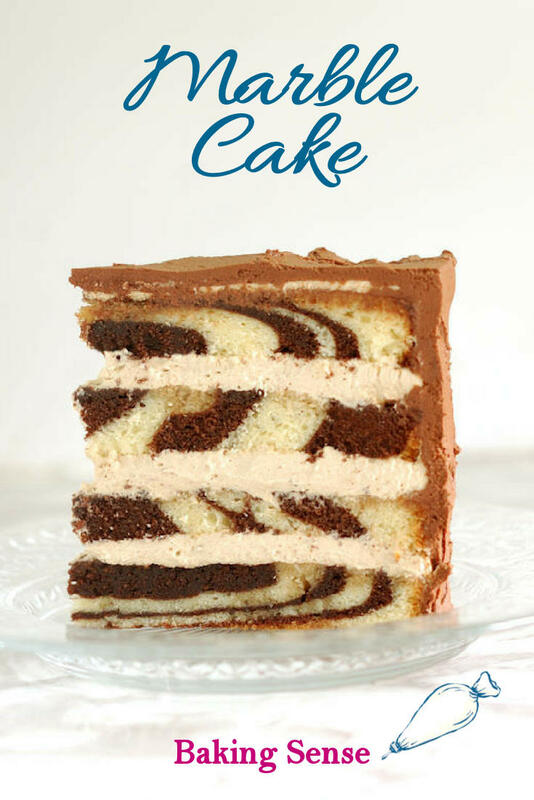 Watch the recipe video to see how to make Marble Cake. 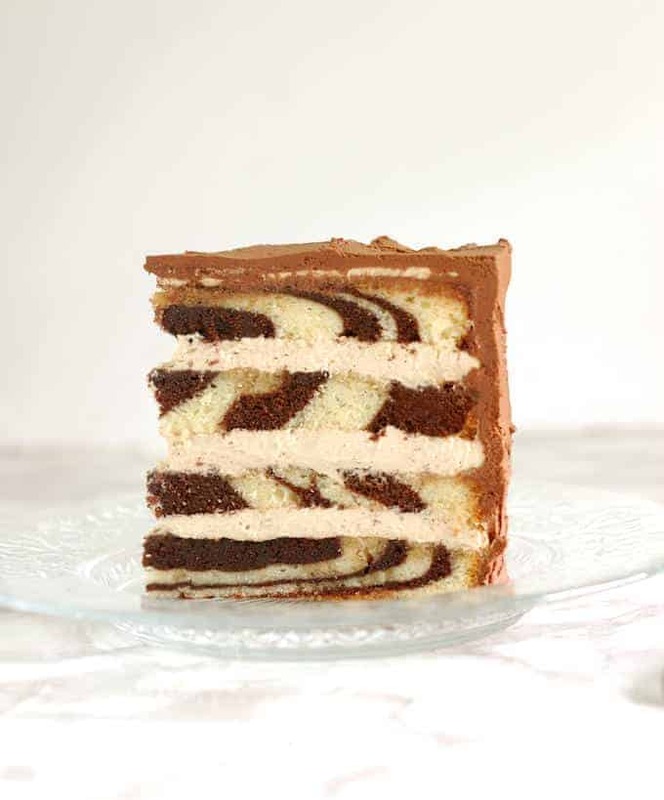 Marble Cake doesn't have to have two totally different textures between the vanilla and chocolate swirls. I created a process for making marble cake so that both flavors have the same exact soft and tender crumb. This cake is so tasty and so pretty. Line two 8 cake pans with parchment paper or butter and flour the bottom of the pans (see note 2). Preheat the oven to 350F. Whisk the eggs and yolks with the vanilla and 3/4 cup of the buttermilk. Set Aside. 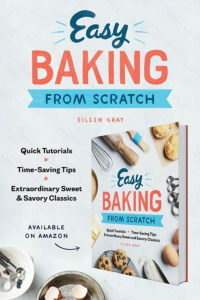 In a the bowl of a stand mixer or a large mixing bowl, sift together 2 cups of the flour with the baking powder and the salt and granulated sugar. Mix the dry ingredients on low speed for 30 seconds to combine the ingredients. With the mixer running, toss in the butter. Add the remaining 3/4 cup of buttermilk. Increase the speed to medium and mix for 2-3 minutes until the batter gets lighter in color and texture. Scrape the bowl and beaters. Add the egg mixture in 3 batches. Sift the reserved 1/2 cup of flour over one portion of the batter and stir it until well-combined. Sift the cocoa over the other portion of batter and stir it in until well-combined. Pour a large dollop of vanilla batter into each pan, then pour a large dollop of chocolate batter on top of the vanilla batter in each pan. Continue alternating the vanilla and chocolate batter until all the batter is gone. Shimmy the pan to settle the batter then use a small spatula to smooth to an even layer. Bake until the cake springs back when lightly pressed or a toothpick inserted into the center comes out clean, about 40 minutes. Cool for 5 minutes in the pan then remove the cakes from the pans and set on a cooling rack and cool completely. 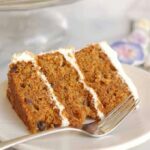 At this point, the cakes can be wrapped in plastic and kept at room temperature overnight or frozen for up to 3 months before using. 1:If you don't have buttermilk you can use 1 1/2 cups of whole milk mixed with 4 teaspoons of lemon juice or white vinegar. Let sit 5 minutes to thicken before using. Buttermilk powderis also a very good replacement for fresh buttermilk. 2: This batter can also be baked in a 9x 5 loaf pan, a Bundt pan or as 24 cupcakes. You will need to adjust the baking time if using loaf pan, Bundt pan or cupcake pan. Cupcakes will take about 15 minutes and a loaf or Bundt cake will take about 55 minutes. Are you sure the amount of butter listed is correct? 3 sticks seems like a lot in proportion to the other ingredients. I made these into cupcakes last night with high hopes, and they turned out terrible. The batter seemed great but after taking them out of the oven, they shrunk up and had a terrible spongy texture. 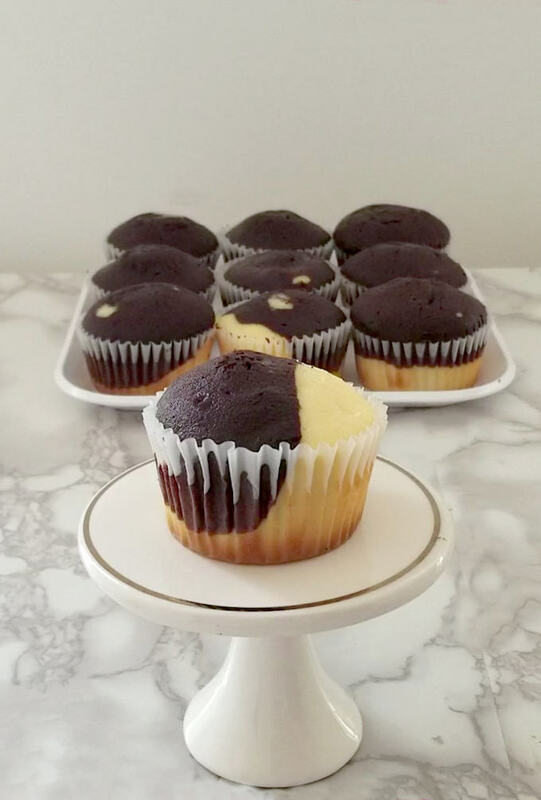 The only time I have seen cupcakes behave this way is when I accidentally added too much butter. Just curious! Hi Holly, the butter amount in the recipe is correct. Since I haven’t made this recipe since I posted it I made some cupcakes today and they were good. 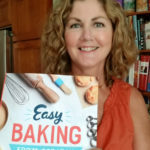 But thank you for asking a question because when I reviewed the recipe I did adjust the amount for the baking powder just a bit.